Our School Garden VISTAs Julia Calder, Becky Glennie and Erin Seymour participated in an Egg Candling licensing course today. 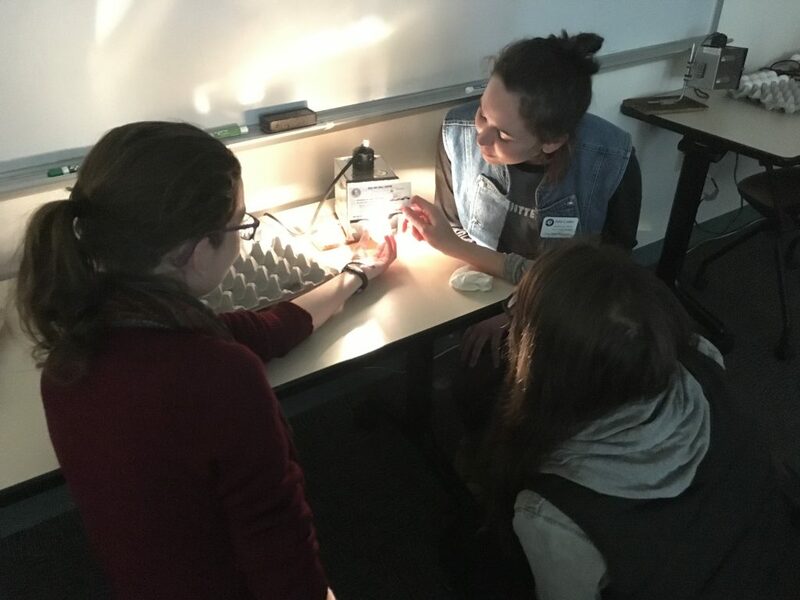 Along with Wick Prichard (School Garden Coordinator and UGA Extension staff member) these ladies learned how an egg is made, the four parts of an egg, the care and keeping of eggs, the quality of an egg and the proper procedures for candling. Information was also shared on how to transport, market and label eggs for selling. It was great to see so many people attend this licensing class: thirty-five were in attendance and some traveled up to 3 hours! Some were farmers, urban-dwellers, country folk and more. The variety of experience and background made for better conversation and fostered great questions. There are definitely technicalities involved with egg candling but also one must be confident in their abilities. Keeping in mind that your product is being bought and consumed by community members helps one to take the work seriously. We were taught that airing on the side of caution is best and I think that this can be applied in gardening work as well: frost is expected tonight? Cover the crops and bring in the eggs! Crops look a little dry? Feed them a bit of water! Yoke looks a bit loose and runny through the shell? Call it a B-Grade instead of an A-Grade. Three out of the four middle schools have chickens and it will be interesting to see how this new knowledge will translate into the sustainability programs. As an individual, I intend to use this knowledge in the later future when I have my own farming business in the Great State of Maine. BIG THANK YOU to UGA Extension, Georgia Department of Agriculture and the ACC Water Business office for hosting. Posted in Farm to Table, Food Systems, School Gardens, Uncategorized, Urban Farming. Bookmark the permalink. Next: Compost your brains out! !